National Petrochemical Industrial Co (NATPET) Stood 1st Position in King Khalid Award – RCI – 2014. 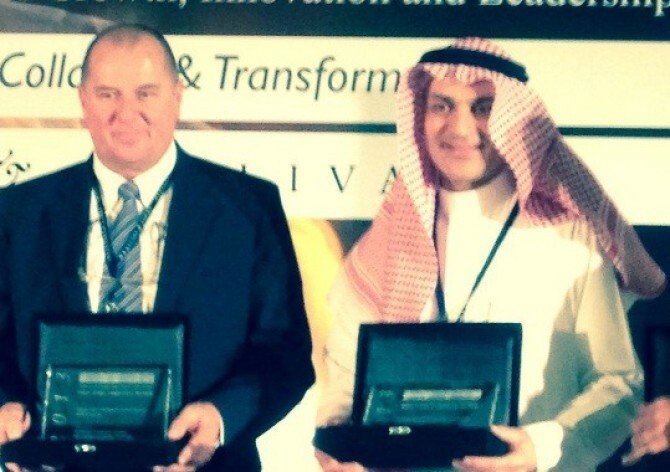 NATPET has won the king Khalid Award –RCI 2014. 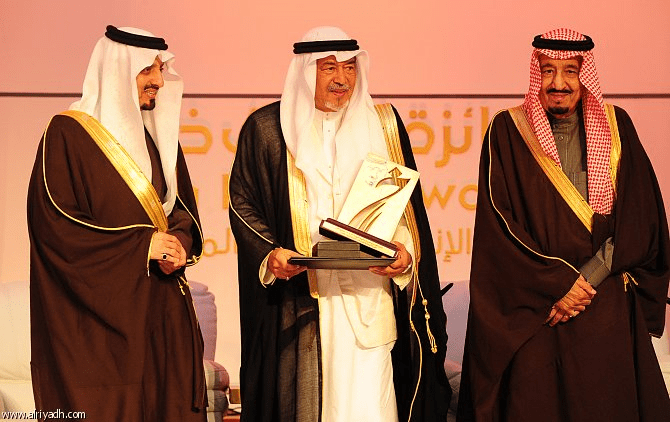 The Award was received by NATPET’s Chairman from His Royal Highness Crown Prince‎, First Deputy Prime Minister ‎and Defense Minister, Prince Salman bin Abdulaziz and His Royal Highness Prince Faisal bin Khalid, Chairman of the King Khalid Awards’ Board during Gala event on December 30th, 2014, in Riyadh, at the Al Faisaliah. King Khalid Foundation is a leader and role model in philanthropic and development work in Saudi Arabia and aims to positively impact peoples’ lives by providing innovative solutions to critical socio-economic challenges in Saudi Arabia. King Khalid Award focuses on the Responsible Competitiveness, which promotes a culture of strategic philanthropy and social responsibility among Saudi companies. 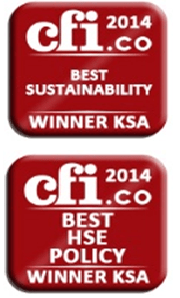 The Award platform serves to incentivize the corporate sector to raise their sustainability performance. The King Khalid Awards are the most prestigious awards focused on socially responsible and sustainable practices in Saudi Arabia and an effective tool for social change and are designed to recognize, encourage and support exceptional achievements by companies, NPOs, and Saudi citizens. NATPET has been participating in this competition since 2010 and always recognized on the victory stand, this year NATPET is considered the best in the category of corporate social responsibility and awarded the First position in Kingdom’s Prestigious King Khalid Award – 2014 . Winning King Khalid Award, requires us to continually maintain and improve our sustainability and competitiveness in operations with the least possible impact on t he environment and to run a highly efficient and effective business that ensures the safety and well-being of employees & community. 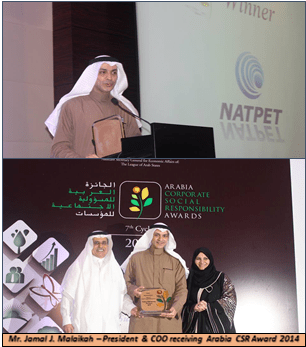 NATPET- Won Arabia CSR Award -2014. The Arabia CSR Award 2014 was held under the auspices of His Excellency Mohamed bin Ibrahim At-Tuwajri, Assistant Secretary General for Economic Affairs of the League of Arab States. The ceremony was held at Grosvenor House Dubai on 28th October 2014. There were six categories for organizations to enter, divided between the private and public sectors. NATPET has been selected as the winner and collected the top honors in the Medium Sized Enterprise Category for the 7th cycle of the Arabia CSR awards, a total of 155 organizations that span 25 industries from 12 countries of MENA region have participated for the award. The Arabia CSR Awards is the most prestigious and coveted CSR Award in the Arab world and has been supported by the United Nations Global Compact since its inception in 2008. The Arabia CSR Network (ACSRN) is the first multi-stakeholder platform that engages small and large businesses and government institutions to strengthen their commitment to sustainable development across the Arab world. The Arabia CSR network also aims to bring into greater focus the local and regional efforts undertaken at the corporate and civil society levels to further the case of CSR in the Middle East. Working under the slogan “Building Partnerships for a Sustainable Future“. The Arabia CSR Network’s aim is to facilitate exchange of ideas and to forge lasting partnerships across sectors for an improved society based on UNGC’s ten principles for human rights, labor rights, the environment and anti-corruption. The Arabia CSR Awards, the prestigious CSR and sustainability related accolade in the region, honors and showcases those companies that demonstrate a clear vision, strategy and implementation of CSR. Every year, the Arabia CSR Awards screens hundreds of applying companies, their sustainability report and their applications to be a part of the sustainability journey in the Arab region. Those companies that best exhibit strong values and commitment towards sustainability, corporate responsibility, social accountability, stakeholder inclusiveness and other such aspects of responsible business are awarded and recognized on a regional platform and showcased at the global level. The Best Enterprise Award project was established in year 2000 in UK to present the best regional companies to European business society and it is given to international business leaders. Europe Business Assembly (EBA), Oxford, Great Britain, – is an independent corporation for development and management of economic, social and humanitarian collaboration. 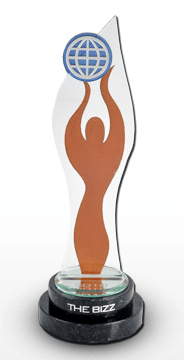 NATPET has been given the Best Enterprise award, the prestigious European award in the quality and management spheres for excellent business reputation, successful management and dynamic growth. •	Faultless reputation in business. The World Confederation of Businesses (WORLDCOB) is a Houston, Texas based business organization is the awarding body of the Bizz Awards, founded in 2005. The BIZZ is the most important business award and it is presented by WORLDCOB to the most outstanding businesses in various countries. The primary mission is to promote business development worldwide, recognizing and boosting the growth of leading businesses and business people in every country through the special tools and services that it offers its members. It gathers and recognizes leading businesses from different regions that contribute to the daily growth of their local economy and the world economy. 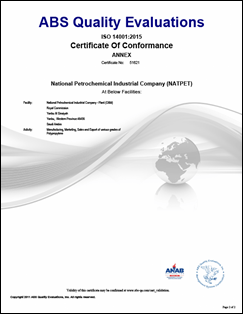 National Petrochemical Industrial Company – NATPET celebrates success measured by six criteria. CFI.co award programs identify individuals and organizations that truly add value. Capital Finance International wants to demonstrate through these programs the many ways in which the economies of the world are converging. Initial nominations are based on input from readers, subscribers, contributors and visitors to this site. The Capital Finance International Judging Panel review information generated during the nomination process and draw on their members expertise to identify candidates for award consideration. Short listed nominees are often given the opportunity to furnish the judges with extra information as the process continues. The committee is keen to reward overall performance without allowing any sort of bias or giving undue weight to reputation. International Recognition by CFI – UK Judges. This year NATPET supported Waste Free Environment Day. Less than 10% of the Gulf’s plastic products are recycled and NATPET is to be congratulated on the way it is trying to re-educate consumers. 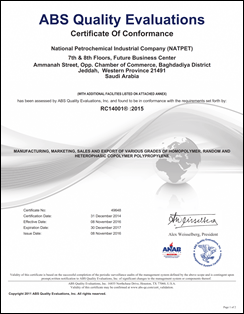 National Petrochemical Industrial Company Achieves First With RC 14001:2015 certification. 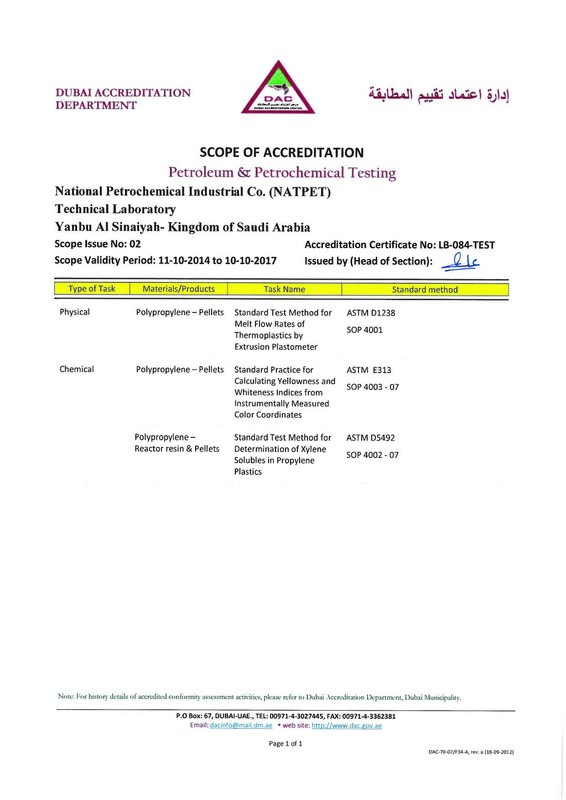 (Houston, TX) ABS Quality Evaluations (ABS QE), has awarded the National Petrochemical Industrial Company (NATPET) of Saudi Arabia the first issued RC 14001:2015 certificate globally. The RC14001® Technical Specification (2015 edition) combines elements of the American Chemistry Council’s (ACC) Responsible Care® initiative with those of the ISO Environmental Management Systems Standard, ISO 14001:2015). This Technical Specification was recently revised in 2015 and enables a company to obtain, through an application and audit process, a certification that its management system conforms to both the ISO 14001 and RC14001 requirements. 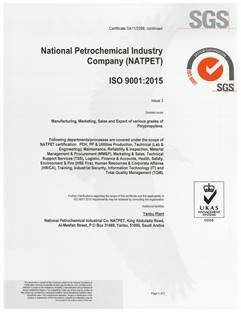 NATPET has acquired accreditation against ISO 17025:2005 – laboratory test reliability and calibration since October 2011. The certification is accredited by the Dubai Accreditation. The renewal of certification audit was successful completed on dated December 14, 201 and continuity has been recommended. ISO 17025:2005 specifies the general requirements for the competence to carry out tests and/or calibrations, including sampling. It covers testing and calibration performed using standard methods, non-standard methods, and laboratory-developed methods. It is applicable to all organizations performing tests and/or calibrations. NATPET has been audited by SGS for recertification against OHSAS 18001:2007 Standard on dated 4th to 6th November 2014. 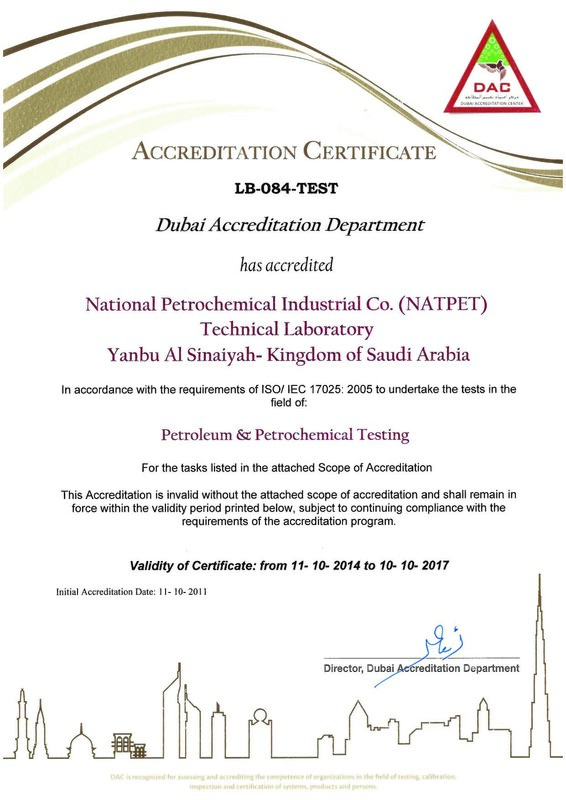 Based on the result Occupational Health and Safety Assessment certification has been granted to National Petrochemical Industrial Company. OHSAS 18001 is an internationally-applied British Standard for occupational health and safety management systems. It exists to help all kinds of organizations put in place demonstrably sound occupational health and safety performance. It is a widely recognized and popular occupational health and safety management system. 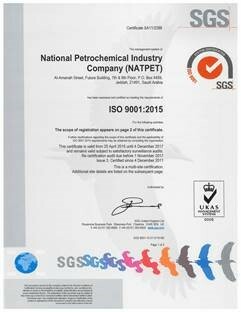 National Petrochemical Industrial Company – NATPET has been audited by SGS for achieving/up gradation of ISO 9001:2015 certification, the first company in Saudi Arabia from SGS –Switzerland and amongst the top in Petrochemical and Chemical industries from all Certification bodies. Revised standard was published on 30th September 2015 while International standard organization allowed two years transition time. NATPET achieved this milestone in just 30 days of publication of standard. 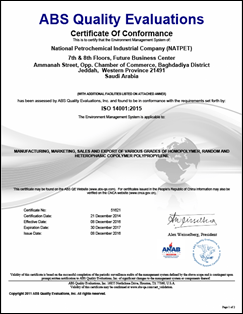 NATPET is certified on ISO 14001:2015 by ABS-QE, USA. Certification is maintained through regular surveillance. ISO 14001:2015 sets out the criteria for an environmental management system. Using ISO 14001:2015 can provide assurance to company management and employees as well as external stakeholders that environmental impact is being measured and improved. • Improved corporate image among regulators, customers and the public. The Marafiq sustainability award for 2012 is presented to National Petrochemical Industrial Company (NATPET). 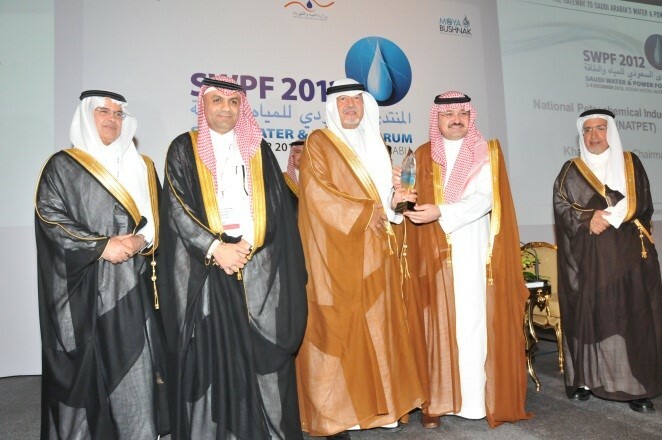 Sheikh Khalid Ahmed Yusuf Zainal Alireza (Chairman NATPET) received the award by the Jeddah Governor His Royal Highness Prince Mishaal bin Majed during official inauguration ceremony of Saudi Water & Power Forum & Exhibition (SWPF) on 02nd December 2012 at Jeddah Hilton. The SWPF is endorsed by the Saudi Ministry of Water & Electricity. 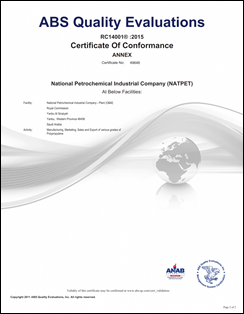 • NATPET has assured various applicable National and International accreditations as an evidence of their effective performance and responsible competitiveness. •	Huge savings of resources as an evident of Economic sustainability and recycling of waste. •	Excellent performance on Environmental & Social Sustainability, including impressive records on Occupational health and safety. NATPET has been recognized amongst the Top 10 “Best Saudi Company to Work For 2012”, in the category of Small and Medium Enterprises, as reported in the special supplement of the daily Al-Eqtisadiah in its 8th June 2013 issue. 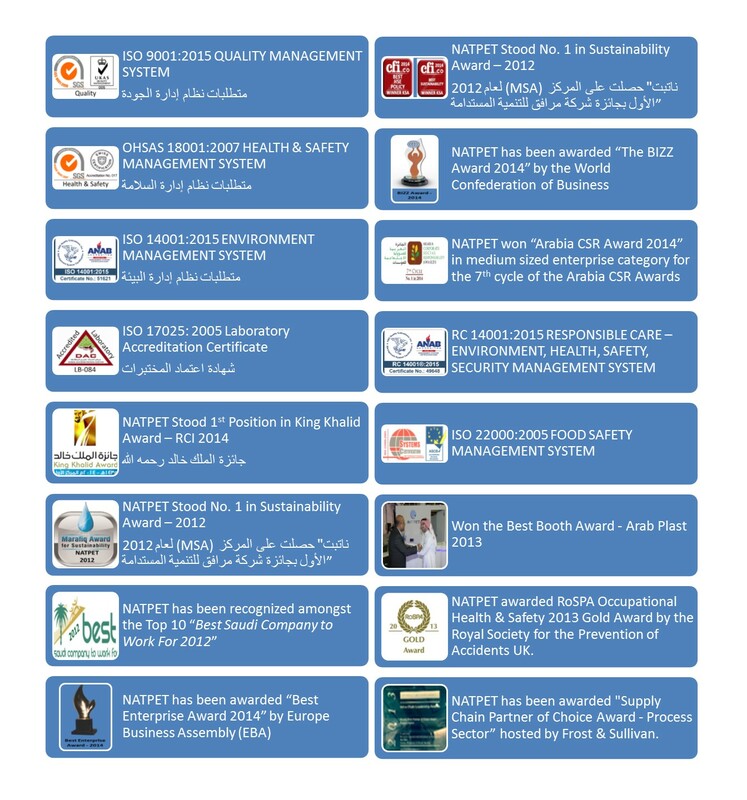 Around 100 companies filed and competed for this prestigious award where NATPET ranked 9th among the top 10. This achievement is a direct result of NATPET’s commitment in making NATPET an inspiring place to work … each and every day. 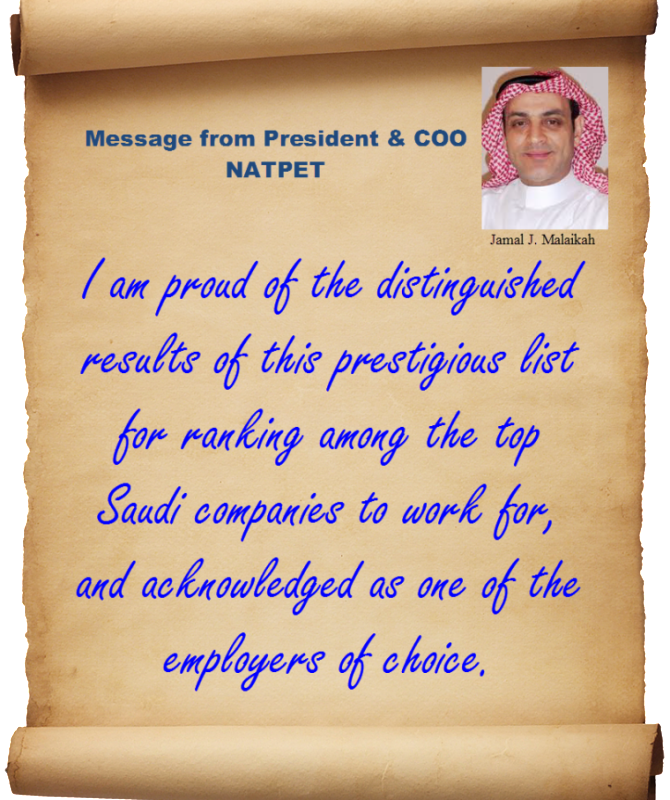 NATPET expressed joy to be honored as a ‘Best Saudi Company to Work For’. The employees of NATPET have confidence in expressing it as a great place to continue their careers at, and they acknowledge that the confe rred ranking is primarily because of having a well-established NATPET approach, its culture and heritage for winning businesses. An emphasis on investment in its people, career flexibility and mobility, extensive training, high-impact client work, a collaborative culture, progressive benefits, and a commitment to socially impacting work have kept attracting talent and maintaining an environment in which employees can rapidly develop, have all contributed to the concomitant strong rating.